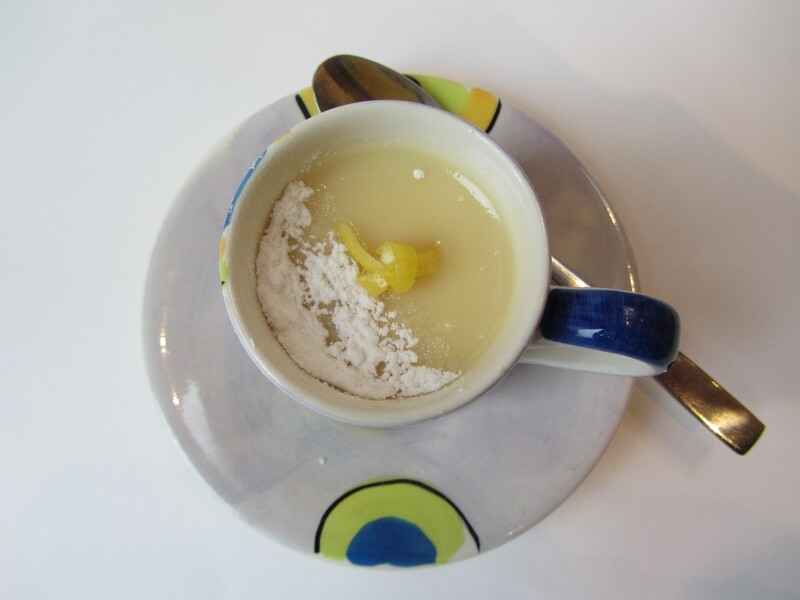 Lemon posset, a traditional English pudding, makes a perfect ending to a lovely meal; the lemon sharpness taking away the heaviness that you might associate with cream. I always thought that a vegan version of lemon posset was an impossibility, surely a citrusy set cream needs dairy content? I can’t say that this version is entirely authentic in texture – sadly soya cream does not have the same setting properties that double/heavy cream has. With the addition of a little agar, the texture remains gooey and unctuous though, and not at all set like a jelly. It’s pretty close to the ‘real’ thing, I would say, as close as you can get with a vegan version. 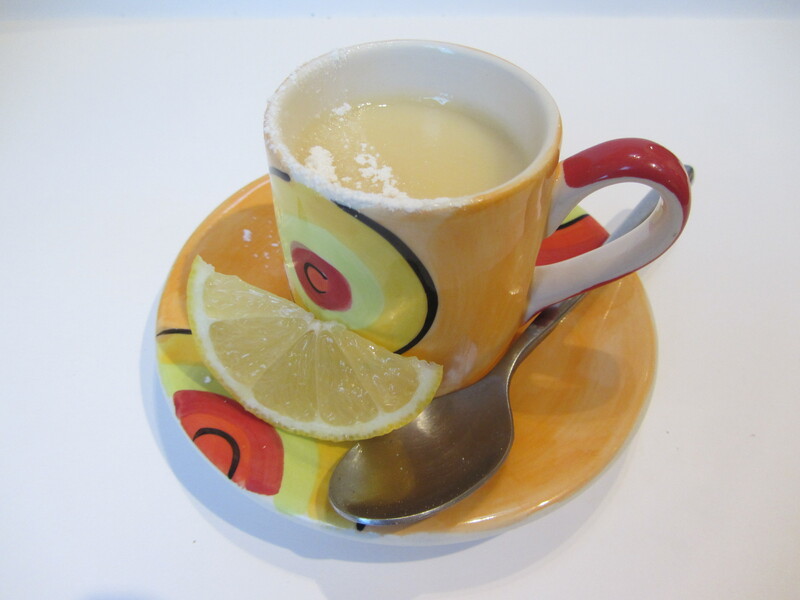 I’ve never seen any other recipes for vegan lemon posset online or elsewhere, so if anyone knows of one that works better, let me know. – Squeeze the lemons and strain the juice into a saucepan. – Add the caster sugar and bring to the boil, stirring until the sugar has dissolved. Set aside. – In a separate pan, bring the cream to the boil, then immediately stir into the lemon mixture. – Once cooled, sprinkle the agar flakes on top. Bring to the boil without stirring, then simmer for 3-5 minutes, stirring now and then, until the flakes have dissolved. – Strain through a sieve into a jug. – Pour into bowls/cups and leave to set in the fridge. – Decorate with icing sugar and lemon peel. I love how you keep creating things that seem like vegan impossibilities! This is perfect and looks really light and refreshing! Gorgeous! I just discovered your website! I would love to share your site with my readers, but we live in the US and have an unfortunate systems of measurement. Therefore, when I write about you, what is the best suggestion you can give them to “translate” your recipes? I use a scale, so possibly encouraging them to use a scale too? I seek your infinite wisdom! Hi, thanks for your lovely message. I’d be delighted if you shared my site with your readers 🙂 I tend to use cup measurements as I always thought they were more popular in the US ( we generally use scales in theUK!) if its a particular recipe you want translated, just ask and I’ll work it out. It’s hard to give definitive translations as all ingredients have different densities! Does that help? Ooops. One more question…how do I translate the oven settings? For each ten degrees c added add 25 degrees f. Does that make sense? !